Setting up a new community – defining roles in moderation and peer support. In September I was contacted by Kerry from The Katy Piper Foundation. The Foundation supports people living with burns and scars. Kerry was looking for more information on managing online forums. She was particularly interested in moderation strategies and procedures for managing safeguarding and escalation. We had an initial chat on the phone where we explored different ways an online peer support community could be moderated and managed. Almost every community I have been involved with has slightly different definitions for members and moderators so it felt important to start by clarifying these roles. Charities like YouthNet (who were pioneers of online peer support) and Mind (whose Elefriends community grew quickly and organically from a Facebook group) saw their moderation strategy and structure grow and develop with the needs of the community. They were often exploring new ground and didn’t always have examples of how a particular approach had worked in the past. 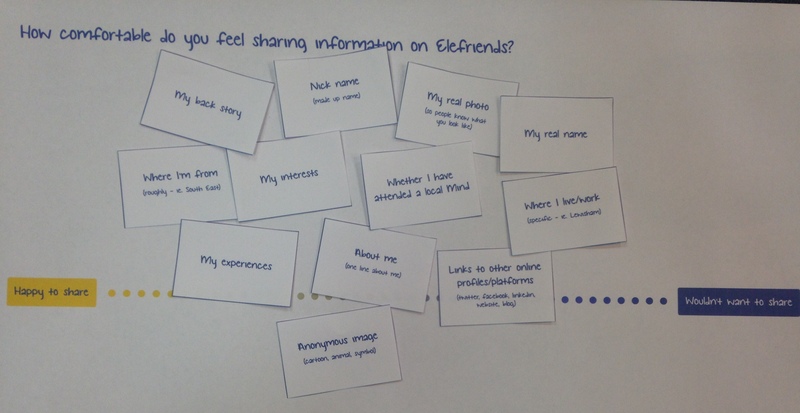 You can see this learning in practice in a post about training community members from 2012. Now online peer support is offered by many charities. It is easier for those looking to establish a new service to understand and clearly define these roles early on. But it’s always important to make sure that there is room for consultation, change and development as the needs of the community become clearer. The most successful communities are co-designed and developed with community members wherever possible. This entry was posted in Current & Recent Projects, Online support & communities, Work & Projects and tagged Community Moderation, Online, Online Community, Online Consultation, Peer Support on October 29, 2015 by fostress. 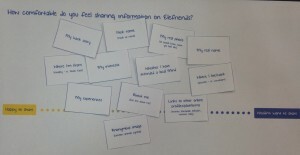 I’ve just finished 9 months working on the mental health peer support community Elefriends. The role was a maternity cover post and focused on community engagement as well as moderation training and support. I organised and co-facilitated six co-design workshops with community members and local Minds. All the workshops had an online consultation component. 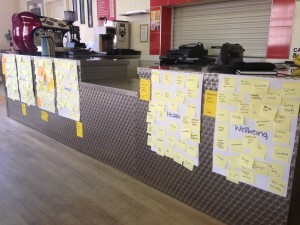 Two workshops to co-create community content and ‘themes’ functionality for Sport England funded project Get Set To Go. Two workshops to co-design a mobile app for the community. The Apple version is in the app store now. I worked with agencies PAN and Yoomee to create and test content and functionality initially developed in the co-design workshops. This included three animations to encourage community members to get more active. You can see the first one here. This entry was posted in Current & Recent Projects, Mental health & emotional wellbeing, Online support & communities, Work & Projects and tagged Community Moderation, Elefriends, Mental Health, Mind, Online Community, Online Consultation, Peer Support on October 23, 2015 by fostress.